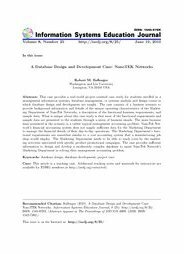 Abstract: This case provides a real-world project-oriented case study for students enrolled in a management information systems, database management, or systems analysis and design course in which database design and development are taught. The case consists of a business scenario to provide background information and details of the unique operating characteristics of the Marketing Department of NanoTek Networks, a description of the functional business requirements, and sample data. What is unique about this case study is that most of the functional requirements and sample data are presented to the students through a series of business emails. The main business issue presented in the scenario is a rather typical management accounting problem: NanoTek Network’s financial accounting system does not supply sufficient data for the Marketing Department to manage the financial details of their day-to-day operations. The Marketing Department’s functional requirements are somewhat similar to a cost accounting system that a manufacturing job shop would employ. The Marketing Department needs to be able to track costs by the marketing activities associated with specific product promotional campaigns. The case provides sufficient information to design and develop a moderately complex database to assist NanoTek Network’s Marketing Department in solving their management accounting problem.